For this post I'm going to do something a little different, and write about a little known quirk with regards to Islam. In fact, I have discovered that many Muslims don't know about this little tidbit, at least those who have grown up here in Australia (okay, it was one who I asked). Anyway, I have recently returned from a trek through South East Asia which took me to Malaysia and Thailand (as well as Cambodia). As it turns out, Southern Thailand is actually majority Muslim, and while we didn't find ourselves down around Hat Yai (due to Australian government warnings), we did spend some time on Phi Phi Island which, if you ignore all the tourists, is also majority Muslim. Anyway, we had just crossed the straights from Singapore into Malaysia, and after checking into our hotel, went and explored the city of Johor Bahru (which was basically Legoland and that is it). Afterwards I was walking out of the hotel and noticed that there was a cat wandering through the lobby. I had seen that cat wandering around previously outside and thought it was a little odd, but quickly forgot about it. About half-an-hour later I returned to discover that the door man was carefully carrying the cat out, and then proceeded to open a can of cat food and feed it. The cat certainly didn't look like it was a house cat, but knowing cats, if it was being fed, then it certainly wasn't going anywhere else. In fact I saw the cat again in the morning, and it was clear that it didn't wander too far from the hotel. A few days later I found myself in the city of Malacca (or as it is know known - Melaka). Yep, this is the same city that was originally established by the Portuguese as a trading post. Anyway, we had just had a look around the old Dutch Church (the Dutch had also set up shop here) and as we were making our way down to the old town, I passed a market stall that sold stamps and coins. Since my neighbour collects stamps I decided to buy some for her (and one thing this is a constant in South East Asia is that where there are tourists, there are market stalls - and taxis). So, as we were haggling for some stamps, I noticed a cat wandering up to the stall, and suddenly, out of nowhere, one of the owners had a tin of catfood in his hand, and was putting it into the dish for the cat. Well, that was odd, but I once again thought no more of it. There weren't really all that many more cat adventures until we arrived at Phi Phi Island. For those who don't know, Phi Phi is a small archipelago off the west coast of Thailand at the entrance to Pha Nang Bay. I've been here before, but only for a day trip, and even then we only spent short time at the village where we had lunch, so I didn't have all that much time to look around. So, since I was heading back I decided to spend a couple of days here, and it was here that the thing about the cats really stood out - they were everywhere. 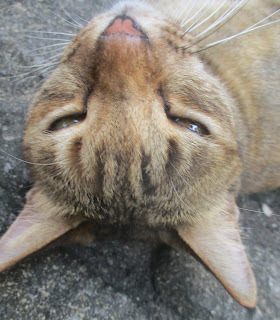 In fact, Phi Phi Don has the nickname of 'Cat Island' or 'The Island of the Cats'. Apparently there wasn't all that much here until the release of a movie called 'The Beach'. This baffles me somewhat because the movie actually wasn't all that good. In fact, perusing the various movie review sites reveals that not many people thought all that much about it (I know I didn't think it was all that great either), yet for some reason whenever I go to Phi Phi island the locals seem to be convinced that the main reason people go there is because of the film. Well, I must admit that Maya Bay and Kai Island (as well as Pileh Lagoon) certainly attract their fair share of visitors, and if you are looking for a Beach experience, you are certainly not going to get it at Maya Bay, but for a tropical island it is quite an experience. Actually, one of the first things I noticed when I arrived at Phi Phi was that pretty much everybody wanders around in their bathers. Well, not everybody - the locals don't, but everybody else does. Mind you, it is still rather amusing glancing into the wheel house of a boat and seeing an open bottle of beer sitting next to the helm, but that is another story for another place. I mentioned that Phi Phi Island was actually a Muslim island, but it certainly doesn't look like it when you actually arrive. In fact, other than the immodesty of most of the visitors, it also has its fair share of bars, which basically means that the alcohol pretty much flows quite freely (along with other substances). I suspect that in the case of Phi Phi, the tourist dollar pretty much trumps everything else, so the locals have learnt to put up with it. However, I have yet to mention the cats. That is the next thing that I noticed, though it wasn't obvious at first. We had dropped our bags off in our room and decided to go for a bit of a wander around the island, namely out to the back beach (Phi Phi consists of two rock outcroppings joined together by a narrow, and low lying, isthmus, upon which the main settlement is built, and was also completely destroyed during the 2004 Boxing Day Tsumani. However, that aside, we had found a nice beach side bar and sat down for a drink, and I noticed a couple of cats wandering about. 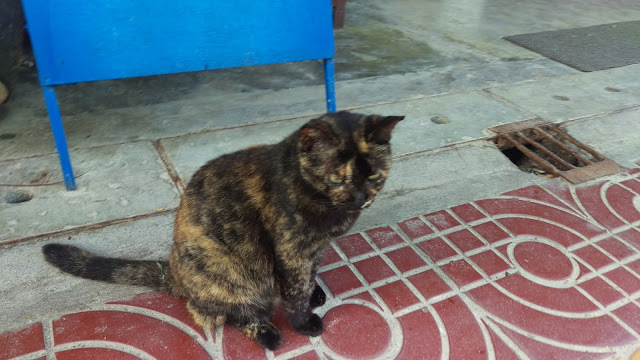 As we were sitting there, the owner grabbed a can of catfood and emptied it into two bowls, and sure enough another one appeared, and the owner simply ignored it. Once again I pretty much ignored it and finished my beer and we then continued wandering around the island. During our wanderings we saw another cat, and another, and another. In fact we started noticing quite a few, but still didn't think all that much of it. That is until that night when I would stop and pet the cats, noticing that pretty much 99% of them let me. Normally cats really don't like people, at least the ones where I live. Sure, you do get the occasional friendly one, but most of them tend to be quite timid and skittish. This was not the case here on Phi Phi, in fact it seemed to be completely the opposite - not only was it an island of cats, but it was an island of friendly cats. Yet I was curious as to what it was with regards to this particular island that made it a haven for cats. Well, it certainly couldn't have had anything to do with cats coming over willingly, considering that they don't swim. Well, they could have come by boat, but once again cats generally don't willingly walk onto boats, and even if they did they aren't like rats, which can generally hide, so they must have been brought over by somebody. Some research on the internet (while I was sitting on the back beach with a beer and watching some fire twirlers go about their stuff) revealed that the main reason is because the Muslim population. The next morning, as I was recovering from the night before, I sat on the bench out the front of our room and watched some kittens frolicking in the garden, and another larger one making itself comfortable on one of my French neighbour's towel. From what I could see there was no reference as to how they first arrived, or why they were brought over, but somebody on Quora suggested that it was around 2012 and due to the lack of vets, and also the locals reluctance to desex them, the population exploded. However, that response was on Quora, but like most of the internet, pretty much anybody can put anything up there. 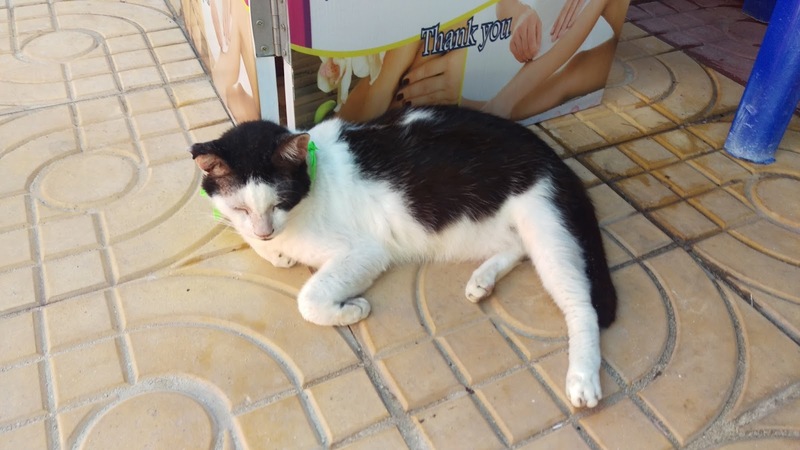 Mind you, it did offer a better explanation that some other blog posts which started off taking about a trip to Phi Phi only to veer off into a tangent about all the wonderful cats there (thought this one seems to have gone in the opposite direction). However, I eventually found my way to the repository of human knowledge that happens to be Wikipedia (though I'm sure that there are a number of websites that can now claim that name, but in the end it all comes back to Wikipedia). Sure enough, the answer to my question was found here - it turned out that Mohammed was a cat person (and when I said that to my pastor, he suggested that so was Mao, though it turns out that that happens to be one of those 'internet truths' - Chinese is a tonal language, so just because a word is spelt the same doesn't mean that it is the same). The story goes that one of Mohammad's companions, Abu Hurairah, loved cats, and one day one of his cats killed a snake that was about to strike at Mohammad. Being thankful, he stroked the cat's head and blessed them. If you have a look a some cats you will notice that there are three stripes on their head, which legend has it that it was descended from this cat that Mohammad blessed. Another story goes that one day Mohammad (or it could have been Hurairah, it is unclear) was asleep and woke to go to morning prayers when he discovered his cat, Muezza, sleeping on his sleeve. So, instead of disturbing the cat he instead cut off the sleeve of his robe. It appears that the only animal that is allowed into a Mosque are cats, namely because they are the only animal that is considered to be Hallal. In fact it is really bad to kill a cat in Islam, and if you do then for that sin to be purged you need to build a mosque. Further investigation also revealed that it isn't just Phi Phi Island that seems be be swarming with cats, but also Istanbul, to the point that it has received the nick name Catstanbul. I did find a blog post written by somebody who had traveled to Istanbul and has cats following her everywhere she went, but I'm unable to find it again. However, I did find a reference to a movie about the cats of Istanbul. I probably should mention that cats have a long history in the Middle East, particularly since the Egyptians used to worship them. Then again that had a lot to do with their ability to keep down the rodent population, particularly snakes (a cat generally wins in a fight against a snake, though they are nowhere near as good as mongooses, who happen to be immune to snake venom). 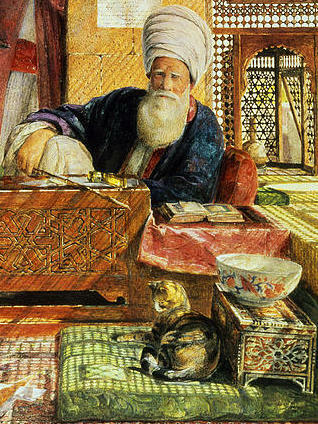 Since the Middle East of the past used to be a place of high learning, there were a lot of libraries, and rodents seem to have a thing for ruining books, which is why cats are allowed in mosques - they not only keep the rodent population down, but in doing so they protect the books, which back in the days before the printing press, were virtually worth their weight in gold. Oh, and the Wikipedia article has some pretty cool particularly the cat pictures.